Chesapeake Bay brogans circa 1901 from Chesapeake Bay Log Canoes and Bugeyes by M. V. Brewerton (photo by George Barrie Jr.). The missing link in the well-known evolution of Chesapeake Bay oyster fishermen is the Brogan. First came sailing log canoes, which are still extant on the Bay, and are raced very competitively to this day. Last came the bugeye and the skipjack—bugeyes are getting scarce, but skipjacks (AKA bateaux) still work the oyster beds under sail, and are among the last sailing workboats in the world. The canoes, brogans and bugeyes were constructed of logs—some of the large bugeyes used as many as seven huge logs in their bottoms, with topsides framing and planking above. Skipjacks came about when the large trees required for bugeyes were all gone. They were built plank-on-frame. The brogans were the direct ancestors of the bugeyes—also built with log bottoms and planked topsides, but smaller in size. The brogan rig, as seen in the photo above, continued to be used, on a larger scale, by the bugeyes and skipjacks, although most of the smaller skipjacks were sloop rigged. Skipjacks photographed by the author in 1995 at Tilghman Island, MD. In 1997, Danger Charters in Key West commissioned me to design a 44′ 6″ skipjack (3-sail bateau), to be used as a day-charter vessel in the “Lakes”—large bodies of very shoal water in the lower Keys, teeming with wildlife. I had been a fan of the type for several years, and had visited the last of the working skipjacks on my schooner LEOPARD in 1995. I designed several more skipjacks over the years, but have never had the pleasure of building one. I learned about brogans from M. V. Brewerton’s excellent book Chesapeake Bay Log Canoes and Bugeyes. While bugeyes were large—up to 80′ on deck—the brogans were small—around 30′ to 35′ on deck. I wanted to design a modern version of the brogan—adapted for cold-molded construction for shoal-draft cruising—but didn’t get around to doing it until December of 2011. The only lines drawing I have ever found for a brogan came from Brewerton’s book (shown below). They show a very lovely, nearly symmetrical, easily-driven double-ended hull of excellent proportions. I could find nothing in Howard Chapelle’s books or in any others in my library. I studied these lines carefully before drawing my own. Lines for a 32′ brogan traced from a plate in Chesapeake Bay Log Canoes and Bugeyes by M. V. Brewerton (derived from a half-model). Sail Plan for the author’s Brogan 33 design. Brogans were double-ended, beamy, of moderate displacement, and shoal-bodied with centerboards. They carried free-standing masts, very raked, with the mizzen raked markedly more than the main. This rig was adopted by the later bugeyes and skipjacks, with less deviation of rake between the masts. Plan & inboard profile for the brogan 33. For my new design, I placed a cabin between the widely spaced deck-piercing masts, high enough to create a feeling of open space even though headroom is limited to 4′ 8″. Accommodations are for two adults in a king-size V-berth and two children on the settees. The V-berth can sleep four adults in a pinch. With a huge sliding hatch, the cook can stand up under a dodger or a boom tent rigged between the masts. 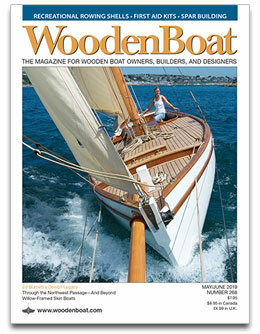 I included the beloved traditional clipper bow common to all Chesapeake Bay oyster boats. I made the side decks wide; with cabin-top handrails (shown), lifelines and stanchions may be avoided. The cockpit is huge, and the seat lockers are six feet long—perfect for lounging or sleeping. Six people could be very comfortable day-sailing. Five watertight bulkheads make this design as unsinkable as possible. With 140 gallons of water, long cruises are possible away from civilization. A drop leaf table is set at the same height as the centerboard trunk, and can seat six comfortably. 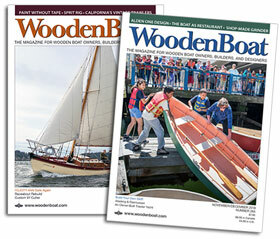 For construction, I adapted my triple-laminate cold-molded wood/epoxy method, which was perfectly suited to the graceful round-bilged brogan hull sections. Alternate construction methods include strip-planking with fabric/epoxy layers inside and outside, and radius-chine plywood/epoxy lamination. Ballast is internal, located beneath the cabin sole on both sides of the centerboard trunk. Construction sections for the brogan 33. Specifications for my brogan 33 are: 32′ 4 ½″ length on deck; 41′ length over all; 31′ 1 ½″ waterline length; 9′ 2 ½″ beam; 2′ draft (5′ 1″ board down); and 12,000 lbs displacement. Sail area is 478 square feet. She may be rowed from the cockpit, sculled, or fitted with a diesel inboard for auxiliary power. If an outboard were incorporated in a well, it would have to be offset so as not to break the full-length keel. I would consider building one as my own retirement home!